Despite the fact that we Editors operate with a great deal of high end digital and analogue equipment, Editing is not a primarily technical profession. Like a painter's brush, a samurai's sword or a mad scientist's calculator, we employ our tools to make the stuff we came in the game for. Stories. Grounded in that realisation, I don't favorize the fact that I am starting this blog with a post not about the inner workings of film history's most profound match cuts or the philosophical implications of the anti-Editing of the long take, but about a rather technical topic. However, if Editing were in fact swordsmanship, this post is about a new, potentially sharper sword. Alan E. Bell is the Editor of popular works like The Amazing Spider-Man, (500) Days of Summer as well as Hunger Games: Catching Fire that is about to come out. He's also a great and truly helpful guy, so when he wrote on Twitter about how he uses the Logitech G13 gaming keypad for Editing, I was intrigued, to say the least. So upon doing some research on the G13, it turned out that another company had just released a very similar device, a counterpart to the G13. "I'm a filmmaker, yo! I ain't playin' no games...playa." Well, then let me assure you, it is well worth your time to take a closer look at some of the methods professional gamers employ to make them perform better. There's money to be made in gaming nowadays and those electronic athletes work at a lot higher reaction times and APM's (Actions-per-minute) to win their games than we do when it comes to hitting the In-point on that perfect frame. Pro gamers also "work" a similar amount of hours we post people will, sitting in a chair, staring into monitors. Now if you manage to get past the fancy name and brand design, you'll find quite an amazing little device. A device I've been editing with exclusively for the last couple of months, on personal projects as well as paid, client-attending sessions. A device I feel is worth sharing with you all. So what exactly would be the benefit of this "toy"? Well, keypad is just another word for one-handed keyboard. Working efficiently in any current NLE requires extensive use of the keyboard and its underlying shortcuts (yes, even FCPX, toddlers). We all know that. But we also cannot go entirely without the mouse/ Wacom (yes, even in Media Composer, veterans). So one thing that always has been incredibly annoying to me in this constellation of input devicery is the fact that I'd really love to have both my hands on the keyboard for all those shortcuts spread over all those keys at all times. But obviously I constantly need to take my right hand off the keyboard to operate pen and tablet. Now a keypad enables me to basically compress all the keyboard shortcuts I need on a daily basis onto an ergonomical paw-like device that I can operate with my left hand only. This way I can have my hotkey commands and pen/mouse interactions going simultaneously without the annoying interruptions of switching my hands around. Heck, I could even go an entire rough cut session with a cup of coffee in my right hand without having to put it down once. Beyond that, I find that it is way easier to tactilely know where the keys are below my fingers than with a regular keyboard. Since everything is so close together and my fingers naturally rest on specific locations on the keypad. Editing this way allows me to keep my eyes on the screen A LOT more than before. And this is major in keeping my view on the footage and my mind in the story. It took me a week or so to get used to the keypad. First couple of days, my wrist would hurt after a couple of hours. This stopped very soon and is perfectly fine now. To develop the muscle memory for where the buttons are, which finger(s) to use for what and memorizing where I mapped all the functions took a couple of sessions as well. You will start out working slower this way than you were with the keyboard, of course. I'd compare it to the transition from mouse to Wacom pen. The key to a pleasurable experience is the way you map your buttons to the device. It will take planning and experimenting. But this can be a good thing as you'll have the opportunity to reconsider the way you had set up your keyboard once upon a time and maybe find that you've been wasting keys for commands you rarely need today. This whole remapping was actually fun to me. But I'm quite the nerd also :-P.
The Orbweaver will not allow for wasting buttons on commands you seldomly use. Although you can map a massive amount of commands to its 8 layers of keymaps, only around 20 can be accessed via that first layer without having to use a modifier key to get to the other ones. It will put you through some tough decisions about favorite commands on the top layer and will force you to prioritize. Good thing is, you can map a modifier key on any button that switches to the next keymap layer with a complete new set of commands. The absolute best genius thing about how this works is that these modifier keys can be set to activate temporarily only. Meaning as long as you hold it pressed, the target layer is active. Once you let go, it automatically switches back to your base layer. Just like any modifier key on a keyboard would. This sounds like a no-brainer when you read it, but in comparison, the Logitech G13 does not do this. Which was the critical difference in my buying decision. I currently use 3 keymap layers in total for every command I realistically need often enough to have it mapped. This includes one layer exclusively for everything related to track activation in Media Composer. Something Final Cut users won't need ;-). Note that besides the modifier keys for switching keymaps, I have also mapped the regular Shift, Alt and Command keys to my base layer to extend the amount of commands I can execute without switching maps. I have spent a brief time trying out the G13 and I'll try to highlight some of the differences to the Orbweaver. Both devices have a different ergonomical "footprint" (...or fingerprint, haha *slaps knee*) and that can be an important consideration. I got big hands and the Orbweaver fits me nicely. But it's also slightly adjustable for different (smaller) hand sizes. The G13 is not. As I mentioned above, the Orbweaver has temporary modifier keys for keymap switching. The G13 has several keymaps as well, but the switcher keys are permanent only and not re-mappable. Meaning you push one of the pre-defined keys, the keymap switches and you have to press it again to get back to your base map or any other map. This doesn't sound like a big deal at first, but I found it would constantly interrupt my flow while working. So that can be a critical advantage for the Orbweaver and it was for me, but it's personal preference, of course, and depends a lot on how you map your buttons. Despite my own choice, the G13 has an advantage over the Orbweaver that may very well be a decisive one depending on your working conditions. The Orbweaver stores your settings in the cloud. 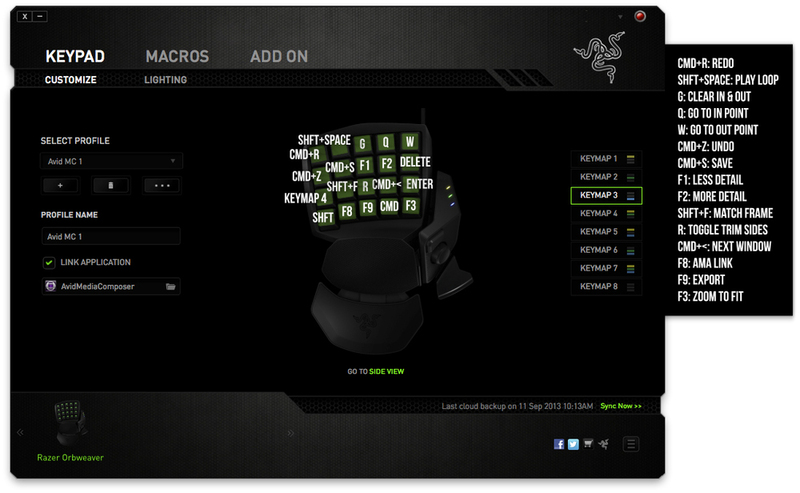 It uses a free app called Razer Synapse which you download, install, create an account for, log in and set up your keys. It then instantly and automatically pushes your settings to the cloud and gives you access to them on any station with an Internet connection and the app installed. That's generally quite handy, but it can also be a catch for some, depending on your work situation. Say you are a freelance editor who works at different facilities a lot, the cloud syncing of the Orbweaver could be a deal breaker. Since you will always need an internet connection to sync your settings prior to first use on a new workstation. At broadcast stations with stricter IT, this might be a no-no. Once you've gone through the initial syncing routine though, it's important to note that you can take the device offline afterwards and work without losing any functionality. The G13, on the other hand, stores all your settings internally, in the device. You'll still need to install drivers first, but you could bring the installer on a thumb drive without the additional need for an internet connection. The Orbweaver is also more expensive than the G13, but it justifies this through its fancy mechanical keys which are a joy to use. The G13 keys pretty much feel like typical PC keyboard keys or the old thick Mac keyboard ones (but still not as nice). The Orbweaver keys have a great sound to them. It's fun to really hit them loud, so everyone knows you're working ;-)! There's also a model that has silenced keys. Which I haven't tested though. The Orbweaver as well as the G13 have a side panel for a thumbpad. The Orbweaver's is 8-way, the G13's just 4-way. But effectively, the 8 inputs on the Orbweaver are way to close together to always hit precisely, so I'd say it's only 4-way as well. Both devices also have two additional clickable keys on the side panel. All of these inputs are just as freely programmable as all the other regular keys and are easily operated by your thumb. You'll use these a lot. I have mapped my two modifier keys for keymaps 2 and 3 on the buttons and the classic up, down, left, right on the D-Pad. So are there any caveats or bugs I've come across? Well, yes. A couple minor ones. To make a long story short: the Orbweaver has been most reliably performing for me when I took it to offline mode. The constant cloud syncing seems to confuse the device from time to time and it would lose the connection to my custom settings. This would go away after a computer reboot and/or reconnection of the device. Still, quite annoying. But really there's no reason to have it online all the time anyway. I take it online for initial setup on a new machine and when I've made changes to my settings to push those back into my cloud account. Offline otherwise. Works nicely like that. In theory this means the software does store the custom settings somewhere on the computer. I have tried to find them to put them on a thumb drive or Dropbox, but to no success so far. If anyone has more luck with that, I'd be very eager to know. Another more annoying bug is that the device will get stuck on a keystroke from time to time. Now this might be just my specific device (mine's part of the very first series they released) and it's a rare phenomenon that always involves a keymap switch, but when it happens, hitting the escape key on your regular keyboard or simply unplugging the device will help. Depending on which command got stuck and your number of undo levels, you might want to do this fast ;-). But again, might be my device only. I'll probably send it in for that and provide an update on the issue, if resolved. So I'm on Avid Media Composer mainly, sometimes Premiere, and I'm loving how the Orbweaver lets me separate my keyboard from my pen hand. Now I can just imagine how awesome this must sound for an FCPX user where the balance between using the mouse vs. the keyboard is much more even. Working with a keypad has had a pretty big impact on how I control my editing software. Although the versatility of using a regular keyboard has always been the hallmark of effective computing, it also has been said that keyboards were made for typing, not editing films. I am not trying to say that editing with a keyboard is ineffective or necessarily slower than using a keypad or any other more specific interface. What I am saying is that keyboards weren't made for our purposes in the first place and thus it can pay off to look at other options that might just improve your workflow, your efficiency, or even the fun you're having operating your NLE. I personally will not go back to the regular QWERTZ. Keypad editing has great potential in my opinion, and not only for editors, but also VFX artists, audio guys, or even colorists. Which is why I hope that more people will start to pick up on this, so we can get the word out together. After all, there are companies who like to create lovely interface devices for us post people and this concept makes way more sense to me than the classic jog/shuttle controllers. Who knows, Razer or Logitech might even be interested in branching off to the film post-production market. That's another thing we Editors have in common with gamers. We love gadgets ;-). So enjoy and comment below or shoot me a tweet if you have any questions about this. And if you buy one for yourself, I'm keen to hear about your experience with it. So here's an update that responds to a lot of requests to post my Orbweaver keymap layouts. This is for Media Composer. I've added a legend to the screenshots, so it becomes clearer what every button does. My Keymap 1 comprises the staples. The very foundation for everything I do. Note that there's added functionality via the Shift-Layer of the Avid keyboard for things like Add transition, Toggle source/record in timeline, Extend edit, Add edit etc. Keymap 2 is all about track activation. There's also an Alt modifier in here to toggle the track monitor to a specific track. Keymap 3 complements Keymap 1 - so there's things like Toggle trim sides, Clear in/out, Save, Undo. Here, again, there's some more Shift-commands like Effect mode, Render, Delete Effect etc. I use the two buttons on the side panel to activate those additional keymaps. Like I've written above, I've set these to activate temporarily. So as long as I keep them pressed the target keymap is active. I've kept the directional pad at the standard up, down, right left. Up/down gives me previous / next edit. Left / right moves the playhead. I also navigate bins and menus this way. So there you go. Hopefully this illustrates one way to set up your keypad for editing. But remember, this is my preference only, for the way I like to work. Go ahead and experiment to come up with a set-up that suits you. It also generally helps to re-think the way you have buttons mapped inside your NLE to make the most effective use of the keypad layout. For instance, I used to have Select tracks to the right mapped to F5 in the Avid when I was still using a regular keyboard. For the Orbweaver, I re-mapped it to Shift+L. Giving me access to that command on my Keymap 1 without having to waste another extra key. --> Think outside the box ;-).